We are proud of our growth and the academic excellence offered at St. Pascal’s! The NWEA Measures of Academic Progress (MAP) assessment is given in the Fall, Winter and Spring to all students in Kindergarten through Grade 8. The assessment results will be shared with parents and/or guardians at Parent (Guardian)/Teacher Conferences. Provides teachers with an efficient way to assess academic achievement levels of early learners so they can spend more time teaching and less time administering individual diagnostic tests. Provides information to guide instruction during the early stages of a student’s academic career. Identifies the needs of all primary grade students, from struggling to advanced learners. Grades 2 through 8 take MAP computerized, adapted tests in Reading, Language Usage, and Mathematics. When taking a MAP computerized test, the difficulty of each question is based on how a student answers all previous questions. As the student answers correctly, questions become more difficult. If the student answers incorrectly, the questions become easier. In an optional test, a student answers approximately half the items correctly and half incorrectly. The final score is an estimate of the student’s achievement level. 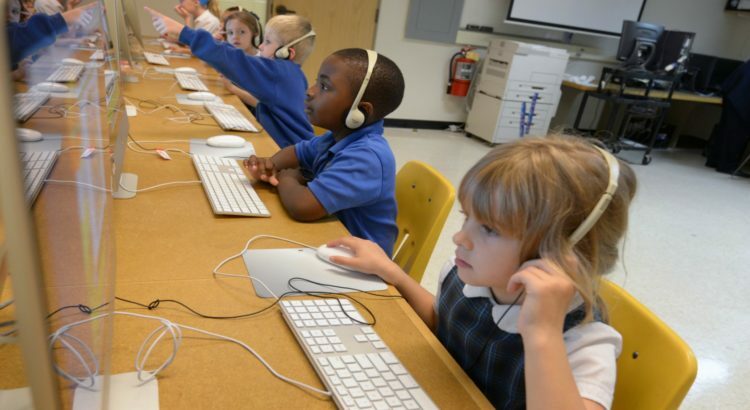 What are the NWEA assessments used for? MAP assessments are used to measure your student’s progress or growth in school. For example, you may have a chart at home which you mark your child’s height at certain times, such as on his or her birthday. This is a growth chart, showing how much he or she has grown from one year to the next. MAP assessments do the same sort thing, measuring your child’s growth in mathematics, reading, language usage, and science skills. The scale used to measure your child’s progress is called the RIT (Rasch unIT) scale. The RIT scale is an equal-interval scale, much like feet and inches. It is used to chart your child’s academic growth from year to year. NWEA has partnered with MetaMetrics, Inc., the developer of the Lexile Framework for Reading. A Lexile range is a score (displayed as a 150-point range) resulting from a correlation between NWEA’s RIT score and the Lexile scale that helps identify reading material that is at an appropriate difficulty level for an individual student. The 150-point Lexile range is included on NWEA’s Individual Student Progress Reports. Also, it allows educators and parents to find books, periodicals, and other reading material that should stimulate a student to new learning while rewarding their current reading abilities. Sign up for a tour today and learn how your child can grow in Achievement, Respect, Service and Faith.